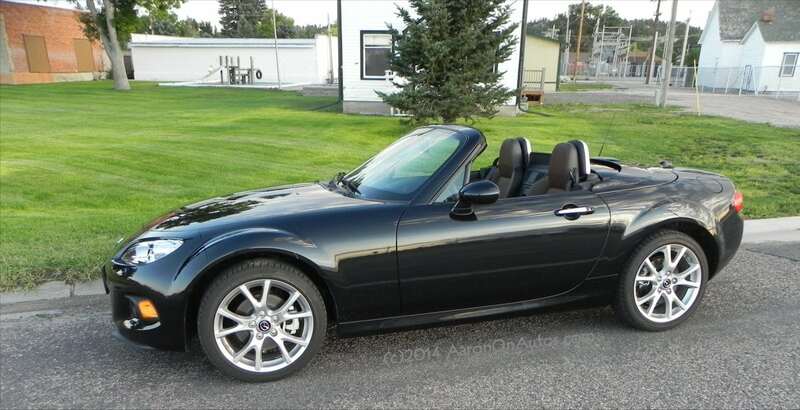 The 2014 Mazda MX-5 Miata is the last of the current-generation of this favorite roadster. Now in its twenty-fifth year, the Miata is the best-selling roadster of all time and one of the most-loved cars on the road today. We find out why. 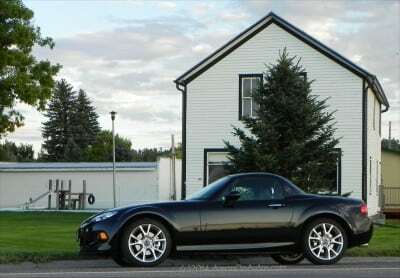 Later this month, the new-generation Mazda Miata will unveil, making the 2014 Mazda MX-5 Miata the last of the current-generation. This is also the last of the Mazda-designed and Zoom Zoom generation Miata as the new one will have Alfa Romeo as a big component. Neither of these is a bad thing, no matter which side of the coin you’re looking at. The hallmark of the Mazda Miata is fun. 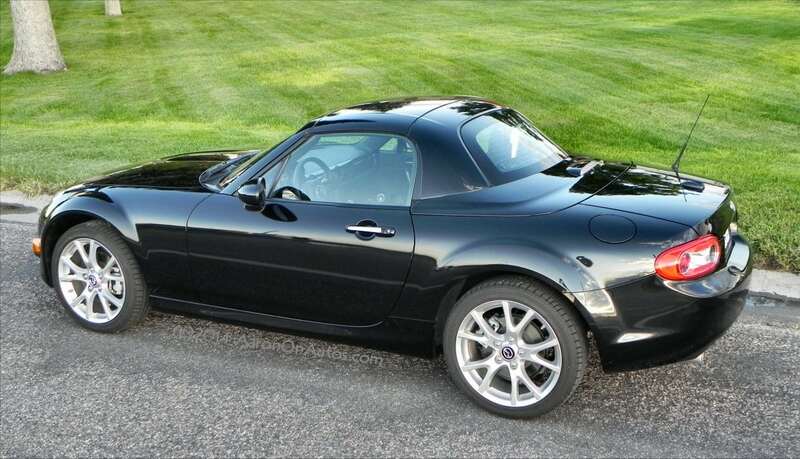 Automotive journalists and aficionados have tried to break down the popularity of this car for years, often making a very complex and over-thought argument for the simplest of ideas upon which the Miata has been based upon from its beginning 25 years ago. 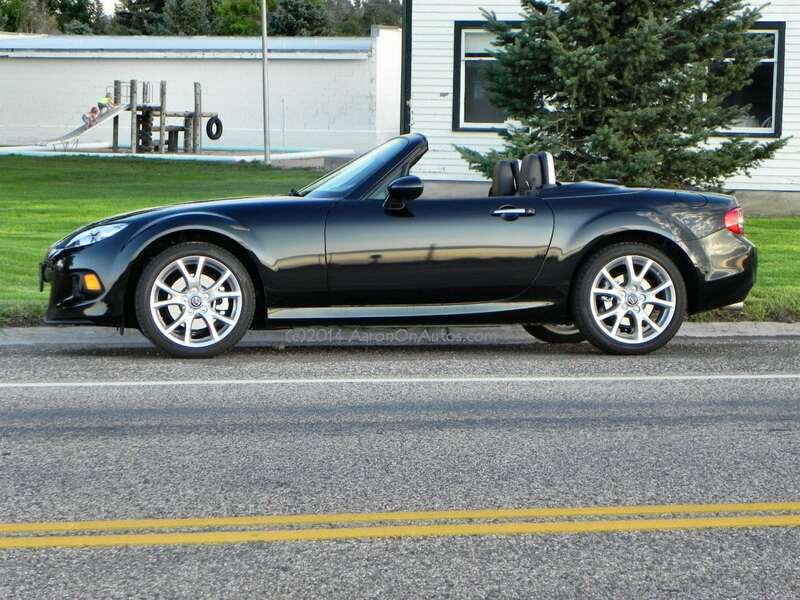 The idea behind the Miata and the reason that this 2014 MX-5 has proven so popular is simple: it’s a really fun car that most people can afford to buy. 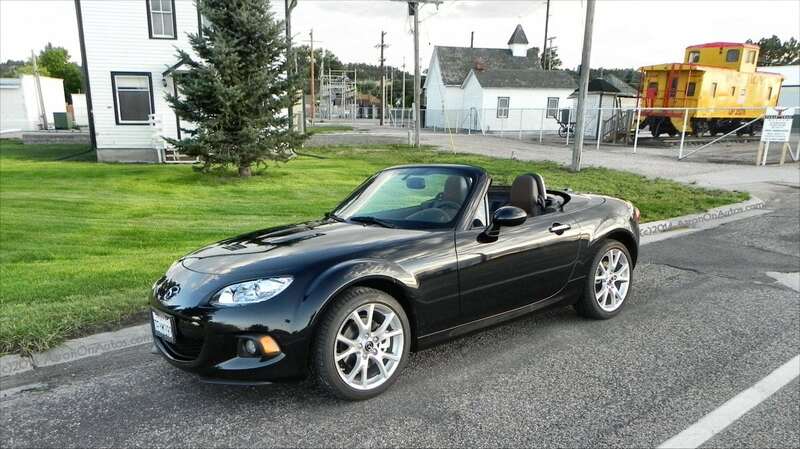 Sure, the chassis, engine, layout, wheel size, and a lot of other things probably play into that equation, but in the end, it’s just a fun car. 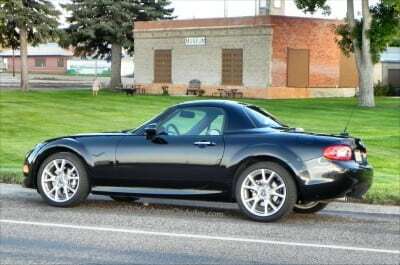 No other explanation necessary and, indeed, for most Miata owners, any more explanation than that is just absurd. The 2014 Mazda MX-5 Miata is a convertible coupe (aka Roadster). It’s a saloon-style 1:1:1 design and has been since its beginnings. The long hood quickly bubbles to a small cockpit (when the top is up) and nearly as long hindquarters. Proportions even out a little more when the top is down, creating a long hood, sizable passenger space, and long rear end. All, of course, being given in relative terms as the whole car is not much larger than many motorcycles with a side car. These simple proportions are classic and engaging. 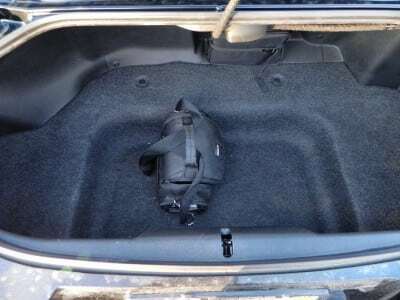 Flairs at the wheel wells create dynamism and two seats of impracticality are somewhat helped by a large trunk that is spacious even when the top is down. 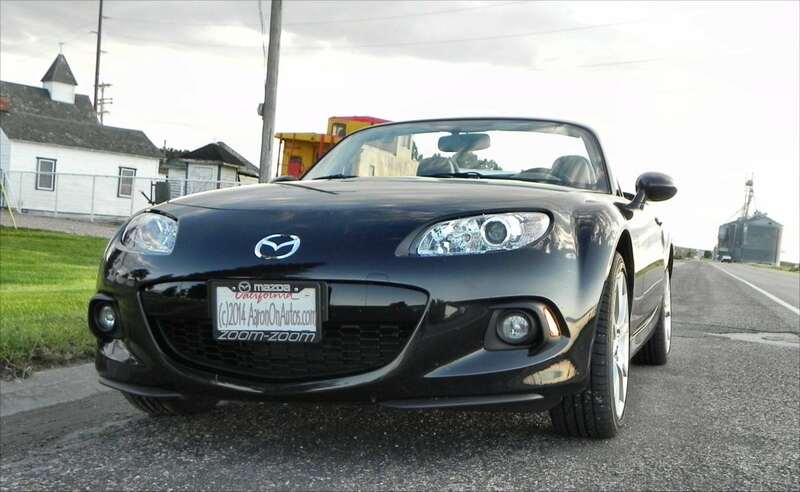 The front fascia has that signature Mazda grin and the rear carries a hint of “haha, I passed you” style. Nothing about the Miata is aggressive, powerful, or threatening. Everything about it is fun, nimble, and exciting. 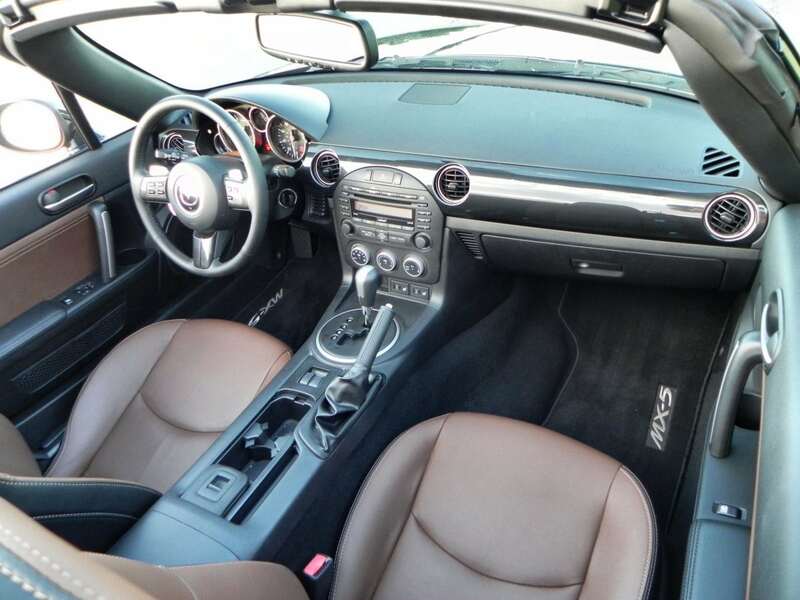 Inside, the MX-5 has two seats and a handful of driver’s controls. It is otherwise spartan. Anything more than that and it would become crowded. Basic driving and climate controls as well as a decent stereo that sounds great thanks to the tiny interior’s lack of void to fill are nearly all you’ll find in even the top-most fitting of the 2014 MX-5. The hard top convertible option, which we drove, is recommended for its higher practicality in bad weather and its more quiet ride compared to the soft top option. 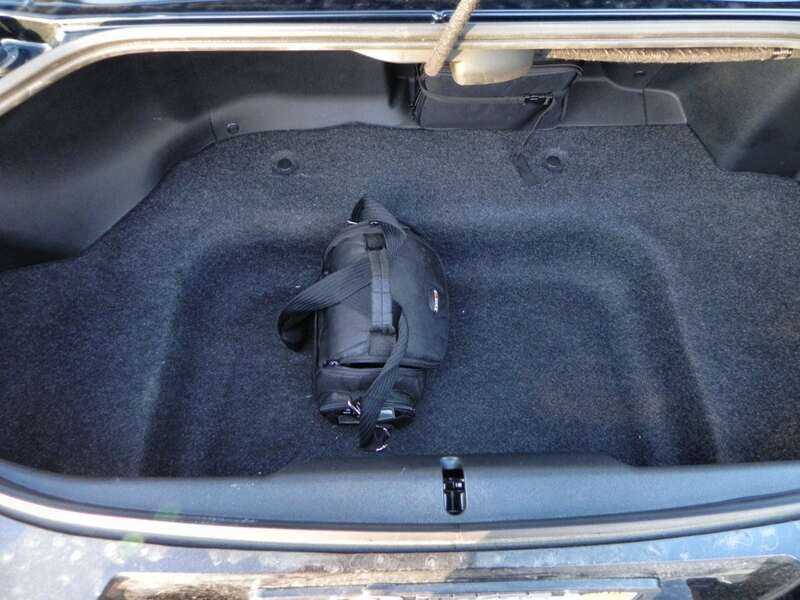 It requires no extra space to fold up versus the soft top and thus does not diminish the trunk or passenger space. It gives a real feeling of solidity when driving this tiny car in bad weather too. Our test model had the Touring package with its heated leather seating in two-tone brown and black, leather trimmed shift knob, 7-speaker Bose stereo, and keyless entry was as luxurious as you’d want the Miata to be without becoming distracting from the primary purpose of the car: driving fun. Before we get to the fun of driving the Miata, a look at what makes it go is important. 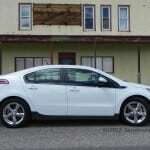 A great little 2.0-liter inline four-cylinder engine turns through a six-speed manual or six-speed automatic producing 167 and 158 horsepower respectively. 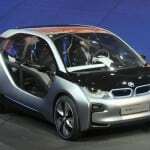 This goes to the rear wheels, of course, and produces a 0-60 time of under 7 seconds and fuel economy estimated at 24 mpg combined (EPA). We saw about that in our testing, which was heavy on highway use, but also heavy on throttle pushing. 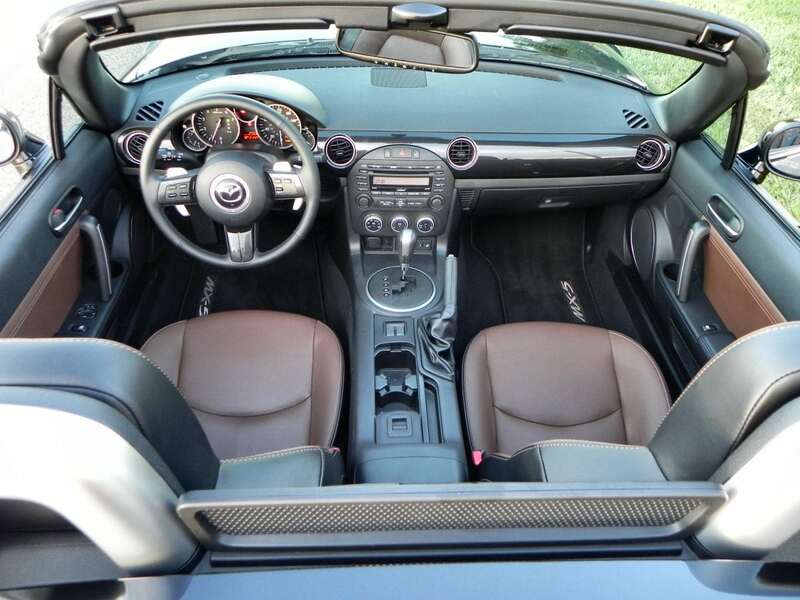 Squeezing into the 2014 Mazda MX-5 Miata is no small feat when you’re six-foot, three inches tall and working in the 250 pound range. 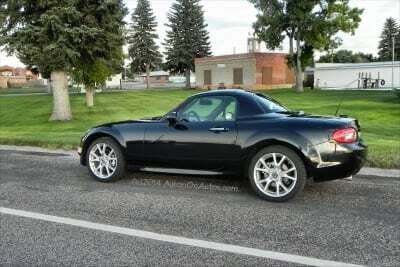 But even with my broad shoulders, big head, and tree trunk legs, I managed to do it quite often during the week I had the Miata. 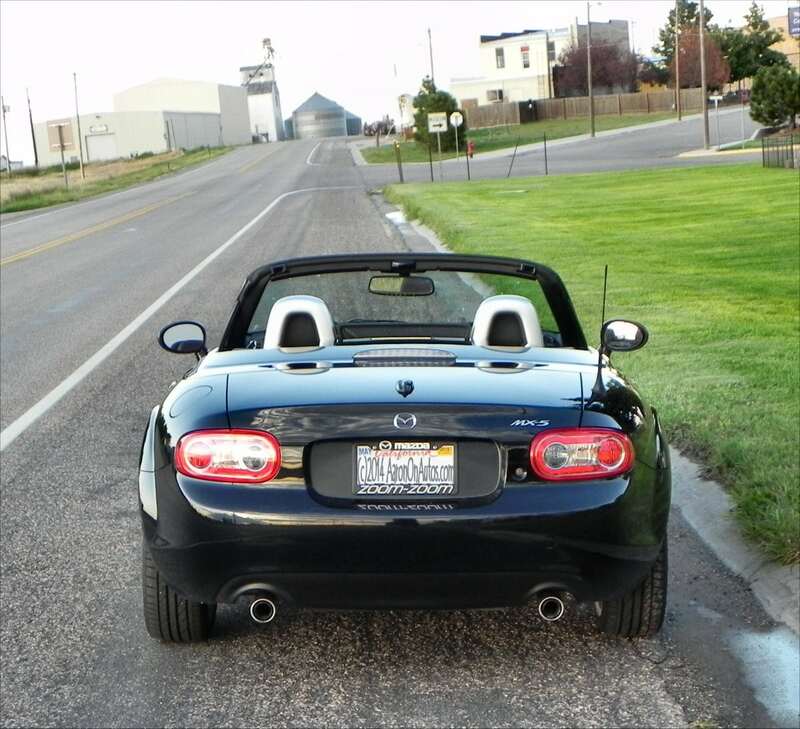 In over 200 miles of driving, I managed to wind the MX-5 around some twisty, long country roads. 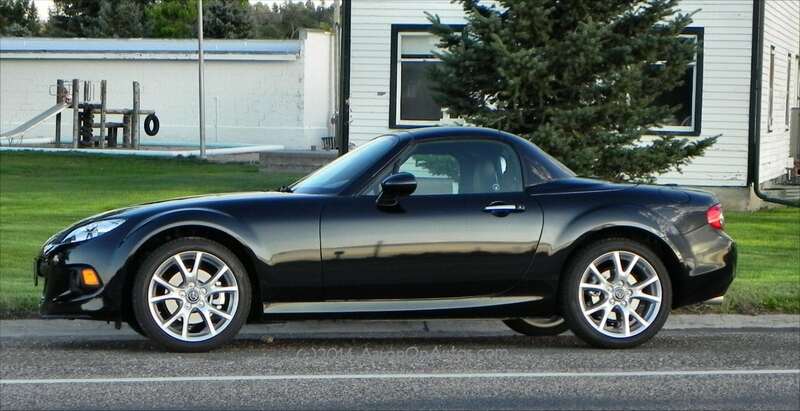 Which is exactly what the Miata begs you to do. Rarely does a car make every curve, no matter how slight, become an adventure. Even in town, where speed limits are roughly 15-20 mph, the MX-5 makes every bump and every start from a stop sign feel like a race. Who you’re racing against doesn’t matter much, it’s the exhilaration that counts. 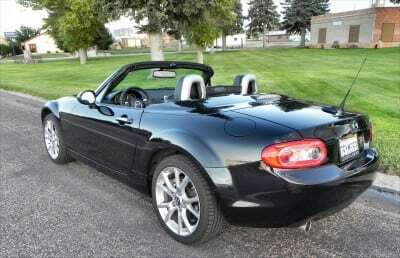 To really get to know how fun this car is, though, is to be in it. Out of all of the great cars I’ve been privileged to test drive this year, only the 2014 Miata had so many requests for rides from friends and neighbors. I suspect half the population of Wyoming was treated to some seat time in my press loan that week. We sprinted up freeway onramps, powered around curves on the Albin Highway, bounced over flood divots on our city streets, and spun over hard blacktop on Highway 30. 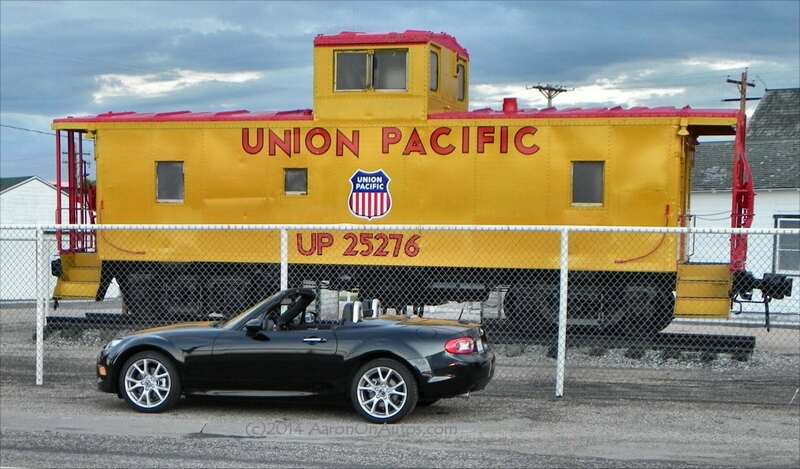 This encapsulates the Miata. It’s fun. All the time. 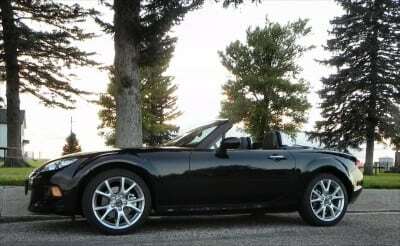 There could be some debate over whether the 2014 Mazda MX-5 has any competition. There aren’t really any cars like it. 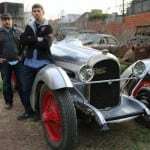 Similar vehicles might include the Fiat 500 Cabriolet or the Volkswagen Beetle Convertible. Of those, perhaps the Beetle is the closest comparison, but it’s still a 2+2 turbocharged convertible rather than a small, 2-seat roadster. Very, very fun to drive. Should I repeat that? Fun. To. Drive. Comparably affordable without being cheap. All the impracticality of a 2-seat roadster. 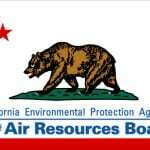 Rear-wheel drive will mean trouble in the winter for many. 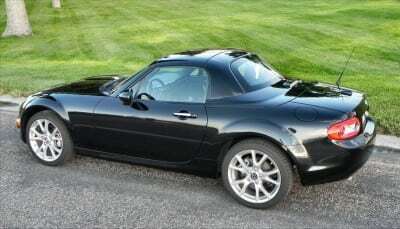 When writing about this car at Guys Gab, I summed it up like this: “Think of the Mazda MX-5 as being the Hugh Hefner of cars. 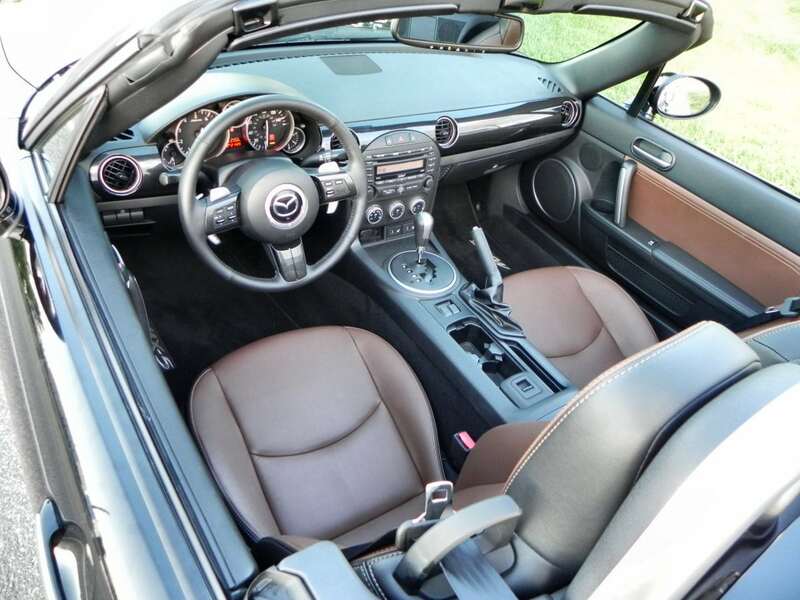 A lot of people like to diss on it, but everyone wishes they were in that driver’s seat.” That, when it’s all said, is the 2014 Mazda MX-5 Miata. 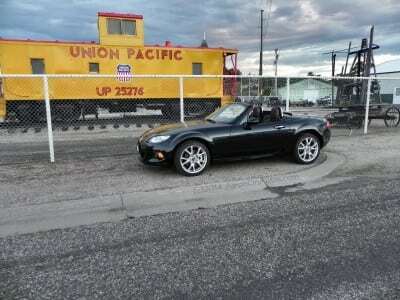 The MX-5 was a manufacturer’s press loan for about a week. Mazda supplied the car as well as a baseball cap and tube of sunscreen for consideration. A total of 220 miles were put on the car during our test week, mostly in highway driving with some in-town as well. 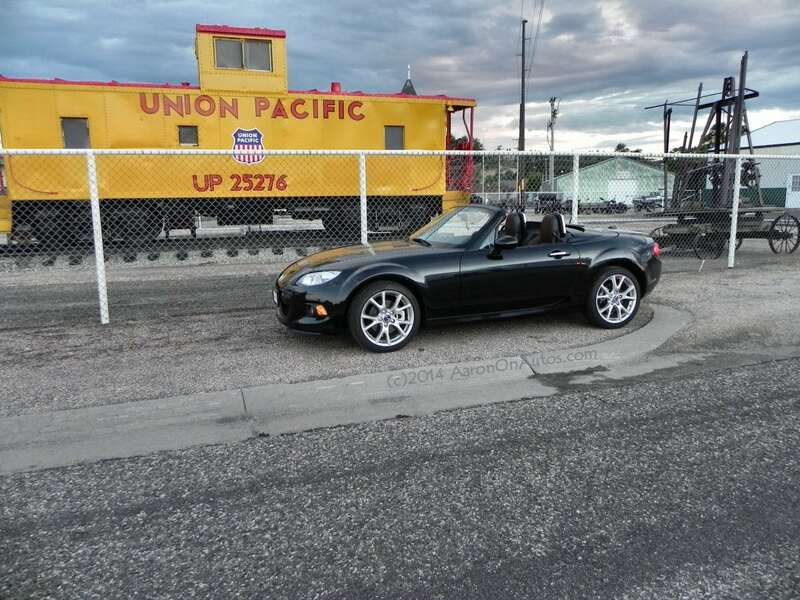 Really nice review of the Mazda Miata Aaron. Hope your body doesn’t hurt too much from contorting yourself into the Miata though. Love that Hefner line as it is pure auto writing gold. 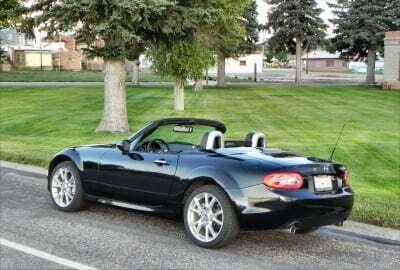 Who would diss on the Miata though? Anyone who does hasn’t driven it.